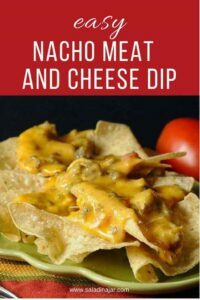 Easy Nacho Cheese and Meat Party Dip, made with Velveeta cheese, sausage, ground beef, Rotel tomatoes and green chilies is easy to make ahead for parties. Serve it out of the same slow cooker you in which you make it. 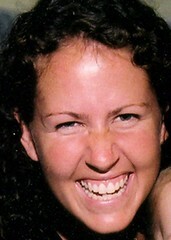 Recently, I asked my niece, Derinda, to send me some recipes for my blog/future family cookbook. And she did. They are simple to prepare and delicious. She has a couple of young kids and lots of friends so the recipes have been expertly taste-tested. LEFTOVER IDEA: This makes a lot! 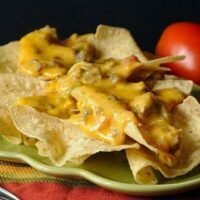 If you have some leftover dip, try making a quick miga of sorts by adding approximately 1/4 cup of cheese sauce and a handful of crumbled chips to an uncooked scrambled egg in a non-stick skillet. Stir gently until all the egg has been cooked. 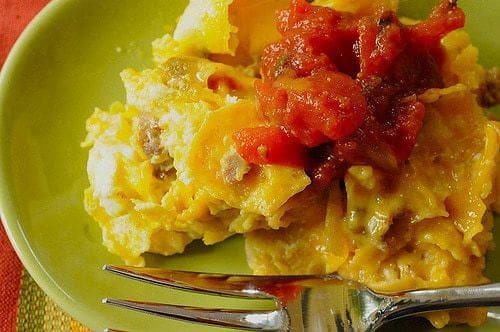 Serve with flour tortillas and salsa. 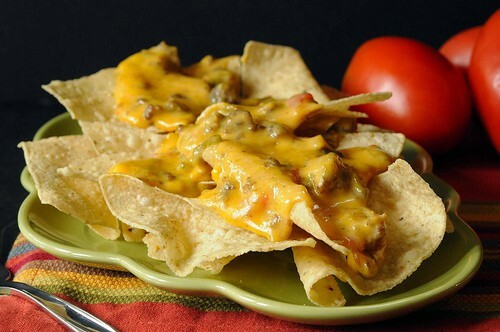 Sausage and beef are combined with green chili peppers and cheese for a filling and hearty party dip. Brown onion, sausage and ground beef. Drain. 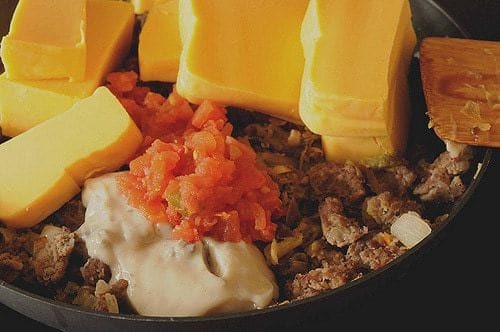 Mix in all other ingredients in a crock pot. Heat until cheese is melted and leave on low in pot to serve. Derinda says she sometimes melts the cheese in the microwave to speed up the process. Thanks Derinda, for an easy recipe that is sure to be the hit of any party. I made this for a young adult Bible study that my husband leads and it was a huge hit. Now they always want it! 🙂 Thanks for posting! This is definitely a family favorite at our house too. If you like a little more “heat” use the “hot” Rotel, or add some jalapenas (anyone know how to spell that?) on top. I like the suggestion for left-overs – gotta try it. So… is somebody making this Sunday? We made something similar in college, we called it “chili cheese fondu” You call tell I went to college in the early 70’s when fondu was oh so chic! That’s a first… I had no idea there was “2% velveeta”! 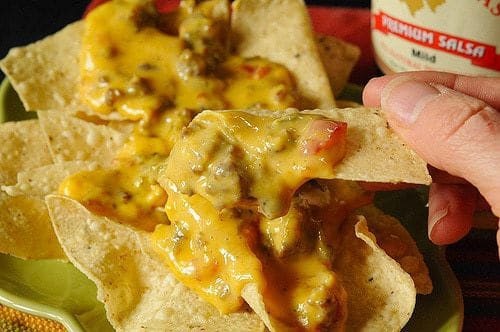 It IS a staple for superbowl nachos though. This looks wonderful – definitely a recipe to keep in your arsenal (for those last minute games)! Wow…I would love that. Looks so delicious. Great for parties too. Thanks for sharing.